Here, in the land of the red rocks, I have begun my second book, the sequel to The Messenger. I suppose it would be more accurate to say that The Messenger II has begun because it is time, I am ready, and I am in the right place. I am merely the scribe, not the author. As it was with the first book, I am being impressed with the continuation of the story of Lukhamen, my Spirit Guide; that is, I see it in my mind’s eye. It is fascinating. I wish I could explain it. I can tell you that this is how it happens: I sit before my computer and the story begins where it left off. Always. No matter how much time there is between segments. And I see it unfolding in the present, even though the lives of the people I write about lived long ago. When the segment (for that is how it happens, in segments) is over, I am back in my own present. That may be confusing. Let me say it another way: When I am in the story, or when I am observing the story taking place, I see it as it is occurring. Not as it occurred. That is why I write it in the present tense. I suppose you would call this channeling. The word for it is not important. The significance of this amazing occurrence is that it is a gift—a miraculous gift— that I can pass on. Not only is the story fascinating—who wouldn’t like to be a witness to the end of an era in Egyptian history—but it contains a message, a wonderful message, a message of hope, a message that saved my life when my son died. The heat of the sun wakes him. He rises upon his arms, and notices that his hands are rough and bloody in places. From crawling? He turns on his hips to half-sit, to see his surroundings. He is in the desert, alone. A scorpion scuttles past him, causing him to start. He needs shade, water. A bush beckons to him, and he pulls himself through the rough sand toward it, dragging his legs. It takes all his strength to reach the sparse shade. He is exhausted by the time he reaches it, and lies prostrate beneath its fragile shelter. He cannot remember how he got here. He dimly remembers a boat, and a river. No, not a boat. A temple barge. The heat scorches his bloody hands and burns the scalp beneath his hair. I had a family. I had a god. The words will not form on his parched lips. They are in his mind, his poor, wretched mind, which does not know what brought him here to this place that must surely kill him with its heat, its searing sun, and its sere, bleak loneliness. He closes his eyes and waits for death. He does not see, nor does he feel the hands that lift him onto the makeshift carrier. He does not feel the wracking ride over the rough rises, nor is he aware of the horse that drags him or its rider. Like you, I do not know what is going to happen. The other part of The Messenger II, as it was in the original Messenger, will be based on the memories I have of my husband Bill, who passed away seven years ago. 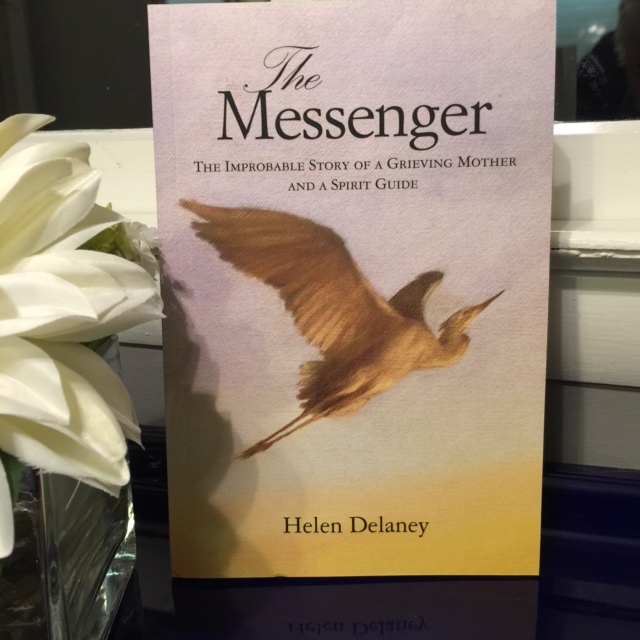 I am guessing that most of my readers have read The Messenger, and understand already how the present and the past can come together in the most beautiful way. I suspect it will be the same with The Messenger II. I don’t mind the mysterious. I don’t mind the inexplicable. I’m used to it. Something inexplicable happens almost every day. If you have the eyes to see it, that is. My daughter Michaela is visiting me in Sedona. I’ve been here not quite a month, so I’m not really settled in yet. My spare room (also my office) is not put together. And there are boxes I’ve still not unpacked. Michaela came out to do some writing, to get away from the energy of New York, seek a retreat, and perhaps experience a new energy. Every morning, we’d start our day with meditation, and every evening we’d quit our work, get out of the house, hike a trail, and emerge our souls into the sacred beauty of the red rocks. Every evening, we’d look for a beautiful place to see the sunset. That’s not hard to do here. Tonight was exceptional. Tonight we didn’t hike. We took a scenic drive. And when I say a scenic drive, I mean a scenic drive. Scenic is such an inadequate word. We took a drive into one of God’s masterpieces. We watched the sun do marvelous things to the sky, and to the rocks, and came back filled to the brim with gratitude and awe. As it began to get dark, and we got closer to home, we noticed a big, gorgeous pink cloud, an aftermath of the sunset. Of course, you can’t capture the real colors with a phone camera. But this is a bit what it looked like. Picture the cloud really pink. Same cloud, but something interesting showed up. 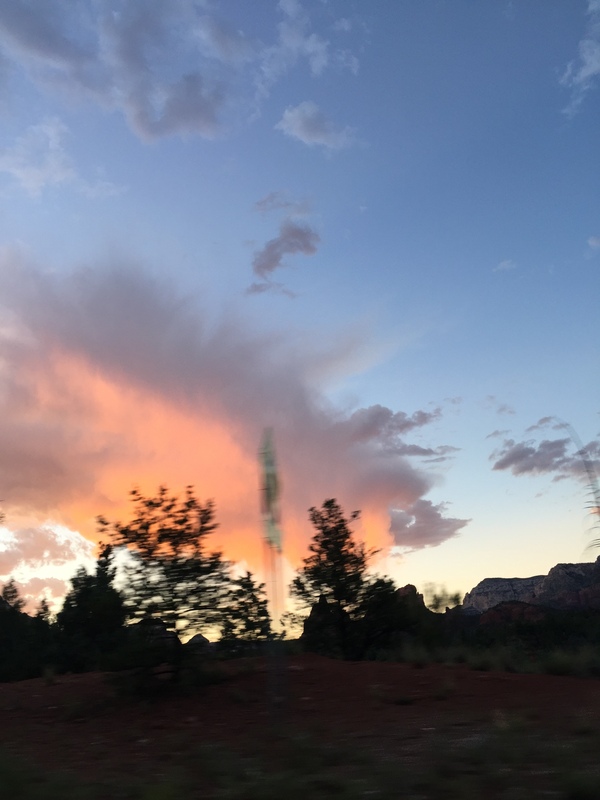 You can see it right in the middle of the photograph, something that seems to reach from the sky into the ground, or from the ground into the sky. Is it a totem? Is it some kind of energy? We are in the middle of energy vortexes here, but I’ve never actually seen evidence of it except in gnarling, twisted tree trunks. I’ve felt it, but never seen it. Whatever this is, it is lovely, and I am pleased to share it with you, dear readers. I’ve come to accept all of God’s gifts, whatever they may be, and I’ve tried to recognize these gifts, large and small, whenever they come into my consciousness. I do have to ask you, my dear friends, if any of you have a technical explanation for this image, please don’t tell me. Some parts of life should be whimsical, spiritual, inexplicable, mysterious and mystical. There is enough hard reality around, these days, don’t you think? Remember, this, too, is reality. It’s just a little bit out of the ordinary.